Sizes come in Children Sizes - Child (2-4), Child S (6-8) Child M (10-12) and in all adult sizes. Christian T-shirts are a unique way of promoting the Ten Commandments. They are great for kids to wear to school! The Ten Commandments are printed in blue on two stone tablets on a white, high-quality Gildan Active wear Heavy Weight Cotton shirt (100% cotton). 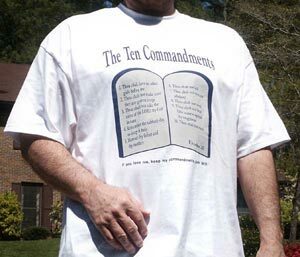 These Ten Commandments T-shirts are in the King James Version. For exact wording, see "Kid's Ten Commandments" below. Fund Raiser Many churches and youth groups have used these Christian t-shirts for fund raising. Most people will easily give a $10 donation for a nice looking t-shirt for a worthy cause, a missionary adventure, or to help a youth group. Contact us for more details. Available adult sizes are Small, Medium, Large, and XLarge. Child size (2-4) (6-8) and (10-12) is also available. The child's age basically will fit most children of that age size. Also have big adult 2X, 3X, and 4X. The Christian T-shirts are Gildan Active Wear Heavy Weight Cotton (100% cotton). Washing instructions: Wash in cold water. Do not use bleach. As these are 100% cotton, they may shrink a little (very little) after washing. Kids like the design of this Christian T-shirt. The T-shirts are Gildan Activewear Heavy Weight Cotton (100% cotton). Washing instructions: Wash in cold water. Do not use bleach. As these are 100% cotton, they may shrink a little after washing. Shipping and Handling is a flat fee of $10.00 per order. Contact us to buy the big sizes in small quantities 2X, 3X, and 4X. The above wording is printed on the Kids Ten Commandments Christian T-shirts above, and Ten Commandments yard signs found on the home page. Does the Law and Kids Ten Commandments apply only to Israel? And the LORD said to him: "I have heard your prayer and your supplication that you have made before Me; I have consecrated this house which you have built to put My name there forever, and My eyes and My heart will be there perpetually." [Sennacherib's Threat and Hezekiah's Prayer] Then the Rabshakeh returned, and found the king of Assyria warring against Libnah, for he heard that he had departed from Lachish.